Rebecca Sullivan shares three recipes to make the most of your citrus haul – Orange blossom truffles, Citronello spritz and Citrus all-round cleaning spray. Well it’s that time of year and the oranges and lemons are all around us (hoorah)! I think there are two kinds of people. Those that are always avoiding paying ludicrous supermarket lemon prices (and constantly posting on social media asking for peoples leftover oranges and lemons). Then there are those that have overflowing trees, desperate to get rid of them before the birds eat them. If only they all lived next door to each other. 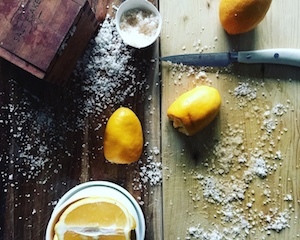 So whether you are one of the other, here are a few citrus inspired recipes to get you through the Winter season. These are somewhat a cross between a ganache-like truffle and a bliss ball. They kind of feel healthy but decadent too. This will clean and sterilise all surfaces – kitchen and bathroom – and leave everything smelling delicious. Mix one part citronello with four parts soda or ginger beer, a handful of your cocktail garden herbs and some citrus peels thinly sliced with the pith removed. This is my version of limoncello and a great way to use up the citrus glut. You can mix and match the citrus anyway you please. Roughly chop the dates, prunes and apricots and tip into a bowl. Cover them with warm water, then cover with a tea-towel and leave to soak for 2 hours. Drain the soaked fruit and then add to a food-processor with the orange blossom water, cinnamon, orange zest and sea salt. Pulse, stopping to stir everything every now and then, until you have a smooth paste. Break the chocolate into pieces and melt with the butter in a heatproof bowl over a saucepan of barely simmering water (or in a double boiler). Take the melted chocolate mix off the heat. Add the fruit mixture and ground almonds and stir well. Chill in the fridge for 1 hour. Line a baking tray with baking paper. Spoon the decorative powders onto a plate. 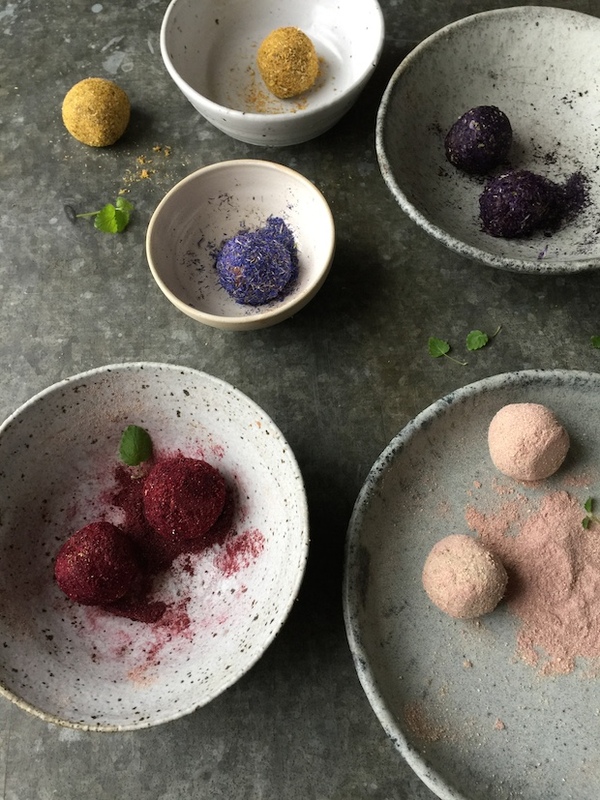 Scoop a heaped teaspoonful of the chocolate truffle mixture and roll it into a ball, then roll in the powders. Place each coated truffle on the lined baking tray. Repeat until you’ve used up all the truffle mixture. Refrigerate the truffles for a few hours to firm them up. Transfer to an airtight container, separating the layers with baking paper. They will keep for a few days in the fridge. 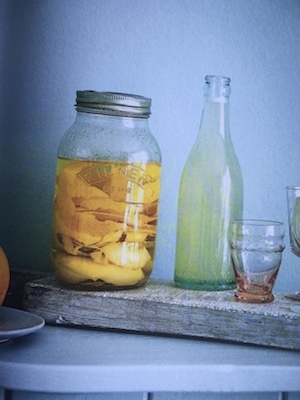 Tightly pack the citrus peel into a glass jar and cover with white vinegar. Put the lid on, and let sit for 2–4 weeks. Strain the vinegar into a spray bottle and top up with an equal amount of water. Spray directly onto surfaces and wipe with a damp cloth. This should last you up to a year. Peel the citrus into long strips of about 1cm wide. Remove any pith, this will make the cello bitter. Divide the citrus into a few large sterilised jars. Cover evenly with the vodka and leave for a week in a cool dark place shaking them a few times each day. After a week, out the sugar into a heatproof bowl and pour over the boiling water, stirring until it is fully dissolved. Pour evenly into the citrus jars and cover with lid, shake and leave again for another week in the same place, remembering to shake a few times a day. After this week, strain into decorative bottles and add a few strips of fresh citrus as garnish. Cello is best left to mature for a few months before drinking and will keep indefinitely. Quick cleaning tip: Sprinkle your chopping boards with salt and use a half lemon (flesh side down to scrub) squeezing the juice as you go. Rinse and leave in the sunshine to dry as sunshine is a natural anti-bac boost.